Over the weekend Micahpalooza continued with a quick road trip to Pittsburgh. It didn't start out too well, since a combination of being in the back seat, the sun beating down on me, and reading and a typing a flurry of text messages* made me sick and we had to pull over three times so I could vomit. Ugh. On the plus side, one of the stops was in New Stanton and, while I was upchucking, I was soothed by the sounds of New Order's "Bizarre Love Triangle" directly followed by R.E.M. 's "Talk About the Passion". For that it won Pennsylvania Turnpike Travel Plaza of the Year. The main purpose of my visit was to celebrate Shamrock & KPMD's** spawn's first birthday. It was truly the best Curious George themed party I've ever been to. Dinner one night was sammiches at the original Primanti Bros. where I had a very heart smart one that consisted of pastrami, cheese, onion, tomato, a fried egg, and French fries. 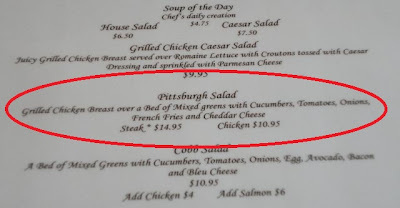 I opted out of the cole slaw because, well, I don't like cole slaw. If that exposed me as tourist, so be it. The fact that I have a beard and not just a mustache did that before I even sat down in the place. 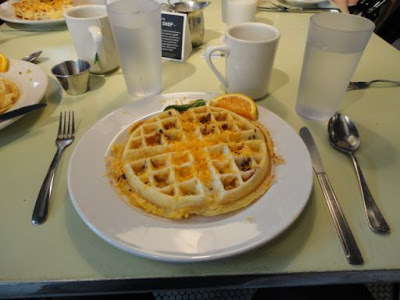 The culinary highlight, though were the Savory Waffles (Bacon! Egg! Cheese!) at The Waffle Shop. They say to try it with hot sauce, but I used syrup. Delicious. I want a waffle maker now. As for the restaurant itself, I especially liked the talk show set up in the back of the place and look forward to checking out some of the interviews they have archived on their site. The trip back was much, much less eventful. And I was perfectly cool with that. *I CANNOT read in while riding in a car. **Remember them? Is anyone reading this anymore? 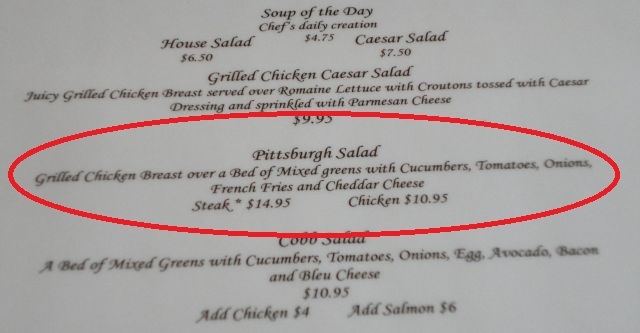 They put fries on everything in Pittsburgh. That makes it 39% cooler than it ordinarily would be. And the populace has a 39% more chance of breaking lawn furniture. Crush of the Week: Britney from "Big Brother 12"